They are literally at the center of all financial reporting in the firm, and there is too much investment in time sheets and related financial systems for senior management to move in different directions. “It’s human nature to remain on the shores of the familiar,” he says. As for the future, he is optimistic, as am I.
I said, “You have a great sales force. Ask them to come back with ideas of what their customers want and would buy if you could manufacture them.” Company president Mel Bissell agreed, and thus was born the Bissell ShampooMaster, followed by several other products. He hired a detergent chemist from Dow, and his shop foreman designed the machine. And thus began a whole line of home cleaning products. Bissell, once just a manufacturer, became a marketing company. Today a new generation and a new approach to marketing professional services is evolving to specifically meet the needs of clients. While all selling must ultimately be done by the accountant or the lawyer, the practice of practice development, incorporating as it may the traditional tools of marketing, will be done by an accountant, a lawyer, or a business-development professional who is totally immersed in the practice, and has the skills and knowledge to reshape aspects of the practice — how it is presented and how it delivers its services — to better meet the needs of the contemporary client. I know that an increasing number of successful firms today are doing pretty much what I’ve described here. Some of the best marketers are accountants and lawyers. Some of the worst are, too. But the marketing profession is defined by its best – not its worst. 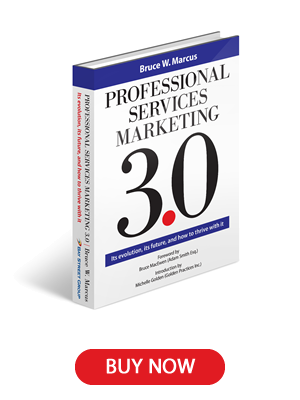 Under Professional Services Marketing 3.0, practice development executives will have business, not just marketing, backgrounds. Marketing mechanics will be done by lower level practitioners, while the strategies will be formulated by the Professional Services Marketing 3.0 specialists – the marketing partners. What has changed here is a new kind of professional services marketing, in response to new market needs, and the need to compete under these new circumstances. What is changing as well is a new kind of partnership between the professionals and those who market their services. That’s Professional Services Marketing 3.0.